Geoffrey was born 23rd September 1158 and died 19th August 1186. 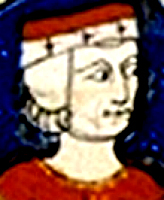 He was the fourth son of King Henry II of England and Eleanor of Aquitaine. He became Duke of Brittany after marrying Constance of Brittany. He was succeeded as Duke of Brittany by his son, Arthur.